Designed for fast, shorthanded cruising, the new Tartan 4300 offers an epoxy hull, carbon fiber spars and the quality to last a lifetime. 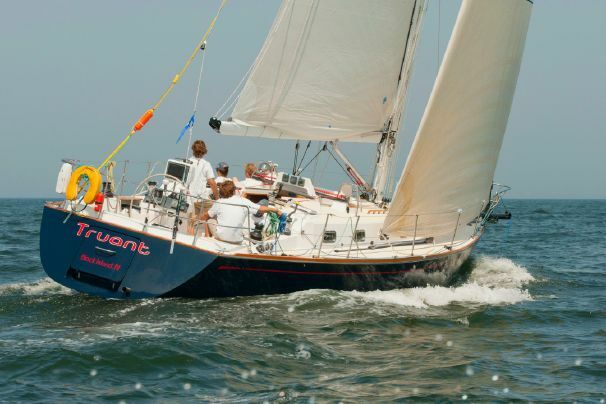 Tartan Yachts has been building high quality cruising boats in Ohio since the early 1960s when founder Charlie Britten launched the first Tartan 27, a Sparkman & Stephens design that set the standard for the company in the years that followed. 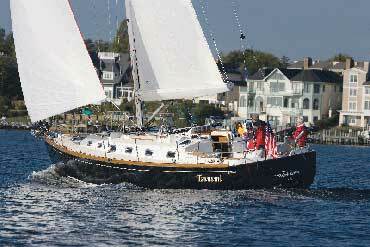 One of the most venerable brands in American sailing, Tartan is one of a very few companies that remains afloat from the early days of production boat building. And, over the last 40-plus years, the company has set the standard for quality and innovation in the “American School” of production yacht design that remains in full force today. Even at first look, you will know the new 4300 is a Tartan and know that it was created to carry Tartan traditions forward. The big news coming out of Tartan and C&C is that the company has been purchased by new owners and that the future for the builder and its associated regional dealers is brighter than it has been in years. So, it was with a sense of anticipation that we joined the local Tartan dealer in Miami following the Miami Strictly Sail show to test sail the Tartan 4300 on Biscayne Bay. From the dock we were struck at once by the boat’s simple, clean lines, the handsome marriage of the deck house to the hull, wide side decks and the large mainsail and small fore triangle of the “Cruise Control Rig.” On deck there is just enough teak to make the boat look like a traditional yacht. 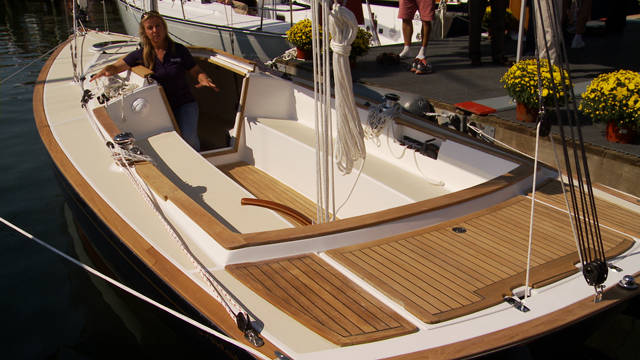 Plus, a dark blue hull always gives a boat an elegant look. We motored south into Biscayne Bay before hoisting the mainsail. The main in the tall Cruise Control Rig sits in a pocket boom that is wide enough for the full battened sail to flake itself and then get covered with a nifty sail cover. 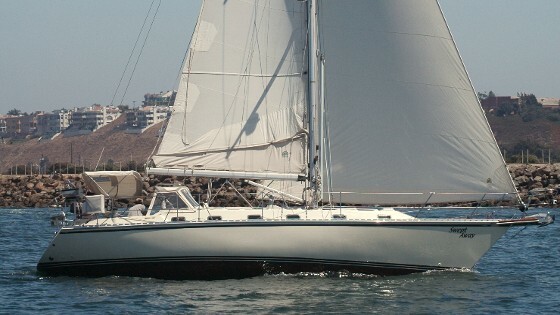 The mainsheet and halyard run aft to a cabin top winch next to the companionway, so hoisting the sail and then trimming it is simple. The jib is even simpler. 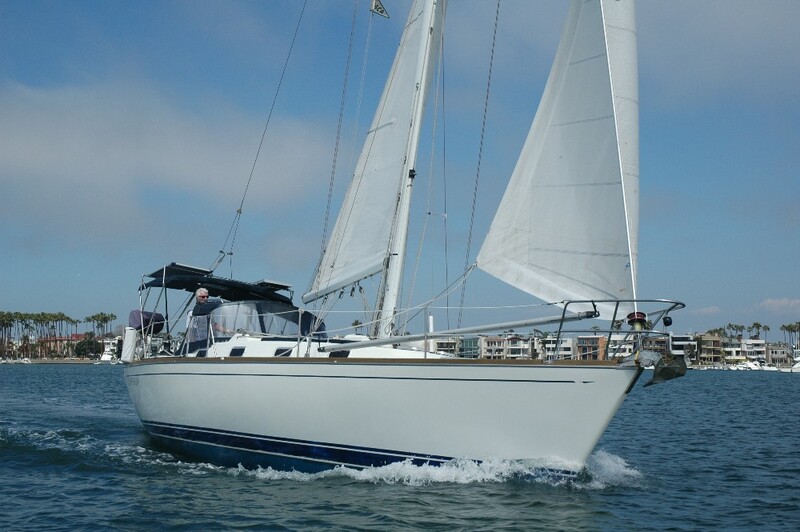 Rigged on a roller furling system, the jib is just under 100-percent of the fore triangle so it can be self tacking. 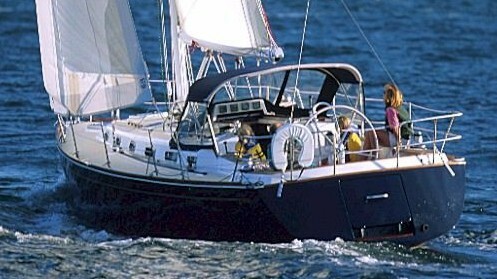 The tack and clew are quite low to the deck so the sail offers maximum drive in a small package. The sheeting arrangement uses a curved track on the foredeck for the sheet car, which runs on ball bearings. 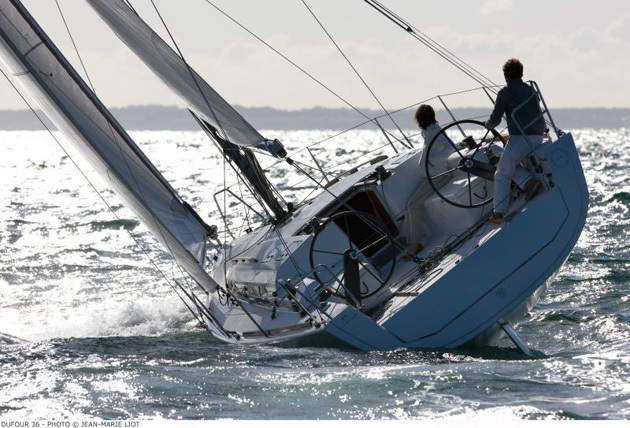 As the jib is tacked the car rolls to leeward effortlessly as the sail luffs through the tack and then fills again. The jib sheet leads from the car up the mast about 15 feet when it runs through a turning sheave and back down inside the mast to the deck where it runs through another sheave and then through deck organizers aft to the sheet winch.